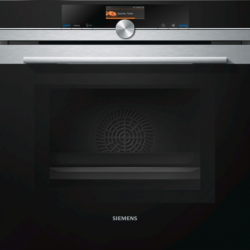 The Siemens HM676G0S6B is a multifunction stainless steel single oven with microwave. Combining multiple cooking modes into one device offers the latest in convenience allowing you to live your life, rather than remain a slave to the kitchen. Here’s a great example. Let’s say you want to cook a jacket potato, but was delayed coming home from work. With a single appliance, you can start the cooking process off with the microwave, and without even having to open the door finish off in the oven. All of this is fully programmable, of course. It’s pretty cool if you ask us! There are a very respectable 13 of these useful functions, which means there is virtually no limit to what you can do with this. The HM676G0S6B also offers a full colour high quality TFT touchDisplay to access all of these features with a single finger. For those (like us) who hate to see and hear appliance doors slamming shut, this and many other Siemens ovens has softMove which is to put it simply a silky smooth soft-closing mechanism. If all those cool features weren’t enough, a telescopic rail is included allowing you to take hot items out without reaching inside and risking a nasty burn. It’s truly the small things which make the biggest of differences! Oh, and one more thing. For cooking frozen food, Siemens have included their coolStart technology which intelligently adjusts the heat to ensure a perfect result; defrost and cook all in one go, it’s very clever indeed.